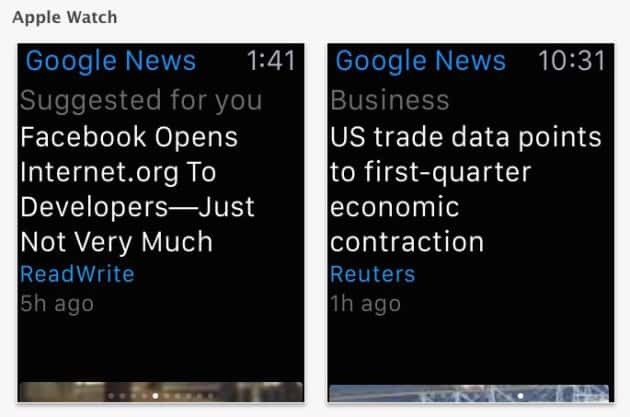 Google finally launched its first Apple Watch App – “Google News & Weather“. This is a pretty useful app for smart watches. I honestly expected Google to provide “Google Maps” for the Apple Watch as a good gesture for their collaboration, but nevertheless, we believe this is a good move for their future collaborations in terms of apps. “Google News & Weather” provides coverage from 65,000 publications and you can simply swipe-access to categories such as Top Stories, Technology, Sports & Weather. You can easily customize the app with your own personalized news sections. You can also save the news article to Safari’s Reading List. You can tune your Apple Watch layout with any of 60 country-specific editions and personalized news sections such as ‘Hollywood’, ‘NASA’, ‘Fashion’, etc. I saw the screenshots, it looked pretty cool for a smart watch, but as far as I heard, this app has very minimal features and people worry that they are missing weather alerts. Looking forward for other interesting apps from Google in future, especially Maps. …. And The Next Google Nexus Phone = Huawei + LG?